Who doesn’t love a bit of retro goodness? From clothing to household items, the appeal of retro or vintage apparel is in high demand these days. 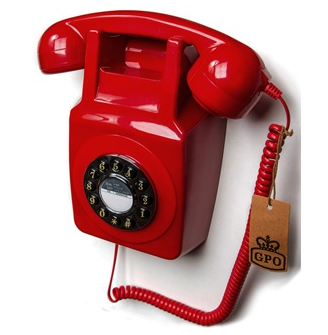 So much so we recently took a call on our trusty GPO; it was the 1960’s and they want their phones back! Who can really blame those psychedelic, free-loving hipsters? We have the best range of retro phones at retro prices this side of the swinging sixties. So allow us, dear readers, to showcase THE most important piece of retro home-ware you will ever need. 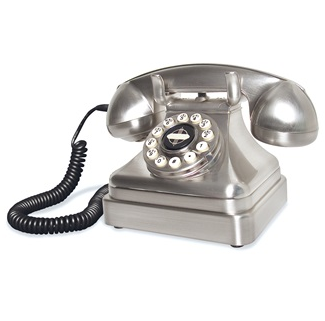 If you’re a fan of Cinematic history then the Lobby Chrome Telephone is definitely the phone for you. Modelled perfectly on the 1930’s style phone, this incredible looking vintage telephone was a staple classic of film and television for many years. Originally made from heavy duty metal the Lobby Chrome Telephone has been redesigned in a lightweight thermoplastic to give it a more comfortable feel without detracting from it’s authentic look. Alexander Graham Bell insisted on answering a telephone call with a hearty “Ahoy-hoy” and so will you with the Retro 746 Telephone in French Blue. This quintessential telephone could almost have been taken from a British TV Spy Series set in the Sixties – it is just that cool! 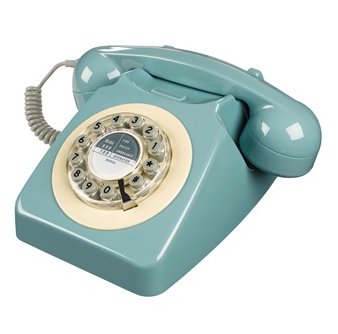 Modelled on the original 746 Telephone launched in 1967 by the General Post Office, this pretty blue phone will take pride of place on a restored side board in your hallway. This ultra cool phone also features a saving as big as the legs on a pair of bell-bottom jeans! The ePure is the perfect fusion of modern style and functionality but with a retro undertone. Although everything about this phone screams futuristic utopia, the classic image of a telephone has not been lost and therefore retains some of it’s vintage charm. This cordless, sleek phone features high quality sound, large digital display and a navigation key for easy user comfort. If you love Andy Warhol prints hung next to the latest entertainment system, then this is the phone for you! 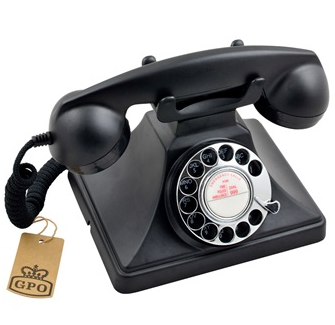 The classic GPO telephone was of course created in Britain and has grown in such popularity that a Union Jack version just had to be produced! 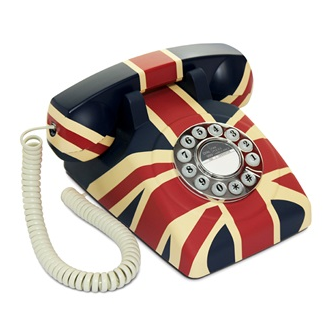 This fantastic phone is a staple Great British icon and would look absolutely fabulous in a home where bold statements are hanging on every wall. Although the Retro Telephone in Union Jack Design looks every bit the authentic piece of British history, for modern convenience the dial has been replaced by buttons so you get a great looking retrogressive telephone without the repetitive strain injury to your index finger. 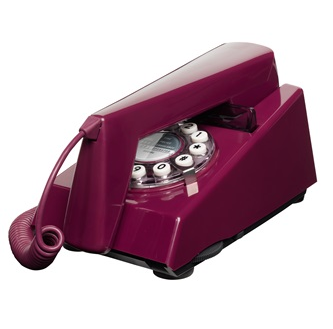 If you’re a fan of Pop Art the Retro Trim Telephone is sure to be a hit with you! Based on the original Trim telephone which became hugely popular in the 1970’s, this telephone could well bring back some nostalgic memories for our readers with its scandalously low, 1970’s price tag. The TRIM or Tone Ringer Illuminated Mode was the first telephone to use a electronic warbler rather than the traditional bell mechanism, which for tech fans in the 70’s was a dream come true. Fun Fact: Some Trim phones in the 1970’s would glow in the dark. For any young Brit who grew up watching American soap opera’s or detective shows, one of the most noticeable differences was that Americans typically had wall mounted phones. So much big hair and gossip was shared with these wall mounted phones and us Brit’s were a tad jealous. 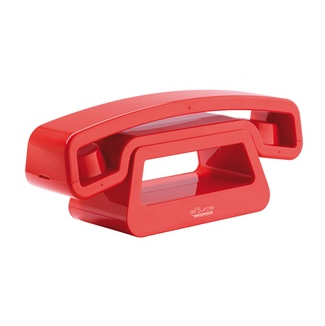 That’s why you pay homage to your inner teenager with a wall mounted vintage telephone in luscious Red. For most Femme Fatales the ringing of a Traditional Rotary Telephone in any film Noir meant only one thing, murder! The GPO 200 Traditional Rotary Telephone is every bit the authentic retro phone, with a look which has been lifted from the Hollywood glamour of yesteryear.. The Traditional Cloth Handset Curly Cord, solid, weighty construction and Traditional Rotary Dial Tone Dialling adds to the sheer desire this incredible telephone creates. 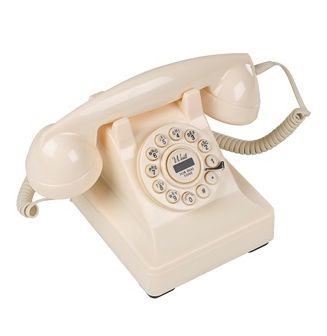 If the black Traditional Rotary Telephone is a little too ominous for you then take a look at the sleek and chic 302 Cream Retro Telephone. Taking it’s design from Henry Dreyfuss in 1937, this vintage telephone was one of the first phones to be designed and created with comfort in mind. The the ear-to-mouth piece measurement was based on the average measurements of 2000 people! For some, retro is all well and good but what about state of the art technology? Well we have you covered with the SWISS VOICE ePure 2 TAM. 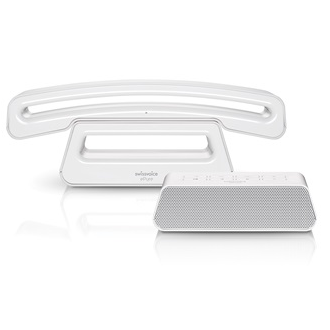 The ePure 2 TAM combines the classic image of a telephone with modern style and the latest telephony technology. The ePure second generation wireless telephone has directory and call management functions including an answering machine, 100 number directory, redial, predial, call duration, caller identification & hands free mode. If you’re a fan of the vintage telephones featured here, be sure to take a look at our full range and pick up a fantastic bargain on a much loved retro classic.